Saree is the favorite outfit of Asian not limited to but including Indian, Pakistani & Bangladeshi women's. Nearly every age group lady adores sarees. It is a traditional outfit, trending across the Globe where Asians live. No one can deny that the Saree is ever stylish fashion wear since long. The next marriage season is coming up. Nowadays, modern styles latest designer sarees have been in high demand for parties and functions due to budget friendliness. Innovative designers are working hard and always think of different styles and designs. A variety of fabrics are available to produce Indian sarees. Consumption of both, Woven and nonwoven fabrics is in great demand. Nowadays, sarees made from fabric produced using natural yarn's are in demand (Cotton & Viscose). The craze of sarees produced out of man-made yarns fabric is also there. Polyester/Nylon/Cationic based yarns like Georgette, Chiffon, Art-silk, and Crepe fabrics sarees etc. are in the boom. 1. Crepe Sarees: It is popular for its dual feel and lightweight. The Rough feel is because of High twisted yarn and luster due to crepe. 2. Designer Fancy Sarees: Various types of fabrics are available to manufacture fancy sarees. These fabrics are woven with various patterns like jacquard, dobby & satin weave. 3. Most demanding Third styles saree is different and unique. These type of saree's fabrics is known as thick and thin & slub fabric. The special air tex yarn is required to produce these type of fabrics. Nylon/cationic/polyester yarns are produced with slubs during the manufacturing with certain purpose. This type of texturizing process is different than traditional texturizing process. These slubs create different effect of thick and thin resembling the property of natural yarn. This is the reason behind special effects, feel & fall like silk, Viscose & cotton. These Sarees are in high demand due to its comfort, feel & fall. The unique & rich look along with its pocket-friendly price range is another reason. 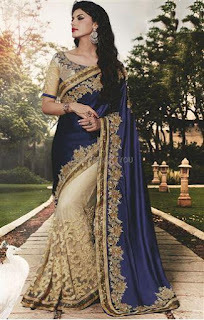 There are various ways to decorate fine looking sarees. Colorful digital prints and block prints are popular among other styles. Heavy embellishments like crafty embroidery, lacework, and hand work are the main part of designing. Apart from that pearl, sequence, stone (diamond) & cut work are in trend. These types of Crepe sarees, fancy sarees & Designer sarees are popular for MODISH LOOK. The Indian traditional wear is now popular around the world for its slick and slim looking style. These sarees are most popular among style-conscious ladies who like to attend marriage ceremonies, reception parties, festivals & gatherings. Let us Have a look at a few amazing styles of latest sarees available online. Look at this party wear saree; drape it & attend the function to impress everyone with the charm of celebrity look. You can be the center of gathering by draping this sea green heavy style. The cool combination of choli style gold brocket blouse is to enhance the beauty of the wearer. Short-sleeved blouse with deep V-neck and V-Back patterning adds to the already existing beauty & Glamour. The broad floral contrast border and heavy lace and embroidery work are eye-catchy. This beautiful Indian traditional wear will bring unexpected compliments to the wearer. The wearer deserves it for her dressing sense. Don’t do typecasting special for the party look. The wearer must pair it with some slick and slim heels for the awesome look. The simple and sober looking gold metallic jewelry will enhance the look making it just perfect for the party. Put on cute Mang-tikka on flat side parted hairstyle with braided bun style for the gorgeous look. Countless styles party wear sarees are available for online shopping. The color combination of Navy Blue and Gold used in this saree makes it operfect for this wedding. Its beauty is enhanced using beautifu lace work that gives it a royal touch. The embroidery done on it seems to pergectly enhance the style. You are sure to give every invitee and yourself the perfect moment making every moment memorable by stealing the show the next grand event draping this latest designer saree. This style is really catching the trend as the Bollywood actresses have recently been spotted wearing them on screen as well as off screen. The main speciality of this style is the blouse which is designer style that ultimately assists in stealing the show. Sarees are generally preferred by aged ladies as the new gen mod girls don’t really like wearing one. But we bet after having to see this gorgeous masterpiece nobody would be able to resist trying it at the earliest. The inspiration of half and half sarees is from south India. The best pick for this style is black and white as it is the most elegant combination that is ever known in Indian fashion. The most royal fabric that makes up for the right choice at the weddings is Velvet. The effect that this fabric gives is unmatchable and is difficult to attain using any other fabric known ever. The pallu is perfectly beautified with the contrast colored stones that takes the style to a whole new level of classiness. On top of it the jacquard weave used for saree would make the wearer look outrageous. The well thought of part in designing this saree is making the sleeves black colored that makes the outfit standout. Make the right use of appropriate golden colored jhumkas and bangles as that will set the look ideal for making a grand entry and creating that flawless first impression. It is a well know fact that red color is the first choice of every lady planning to attend a wedding as it sets the tone right for that particular occasion. This This is our final style for today and the most appealing one too. This saree is perfectly beautified with the red color. The lace used is unique making it suitable for a fashionable lady who loves to set her style apart from the rest. The work done on pallu gives the feel of an embossing and the saree is beautifully decorated with butta work. You may find numrious styles and patterns of Saree For Wedding. If the wearer misses out on any one from maang tikka, big ear rings, and bangles then the resultant look would not come up as desired so we strongly recommend using all of these.